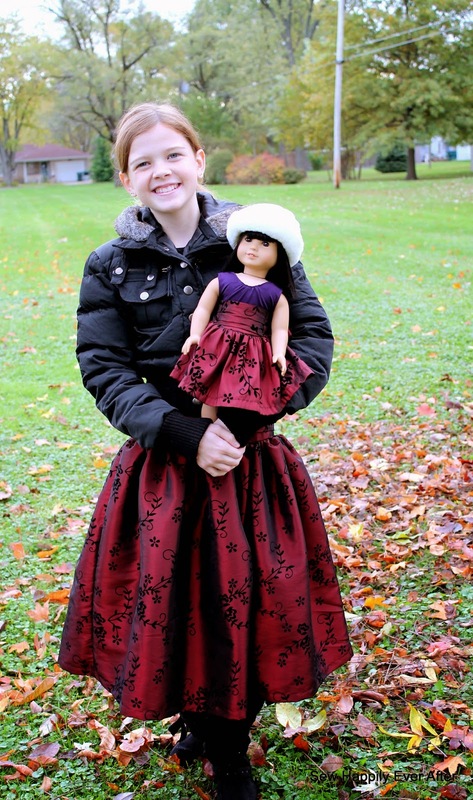 Sew Happily Ever After: Kenzie's Party Dress Blog Tour! Kenzie's Party Dress Blog Tour! I'm back! And this time I'm participating in a blog tour for Everything Your Mama Made. If you are looking for the perfect dress for the holidays, look no further! 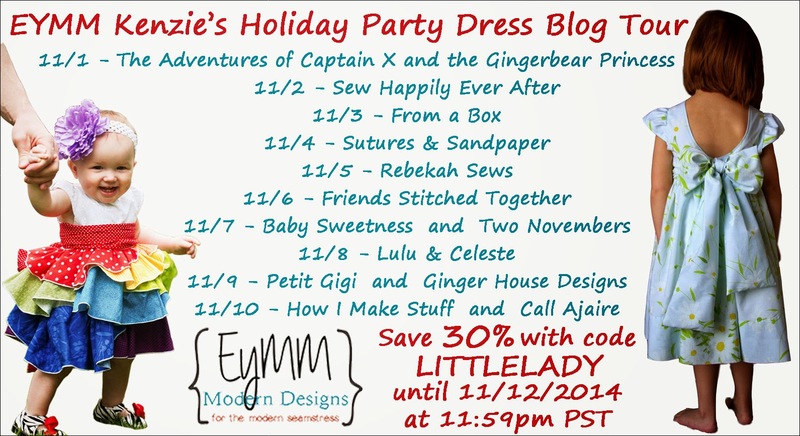 Follow the blog tour and see what everyone is making and perhaps get a bit of inspiration for your holiday sewing. 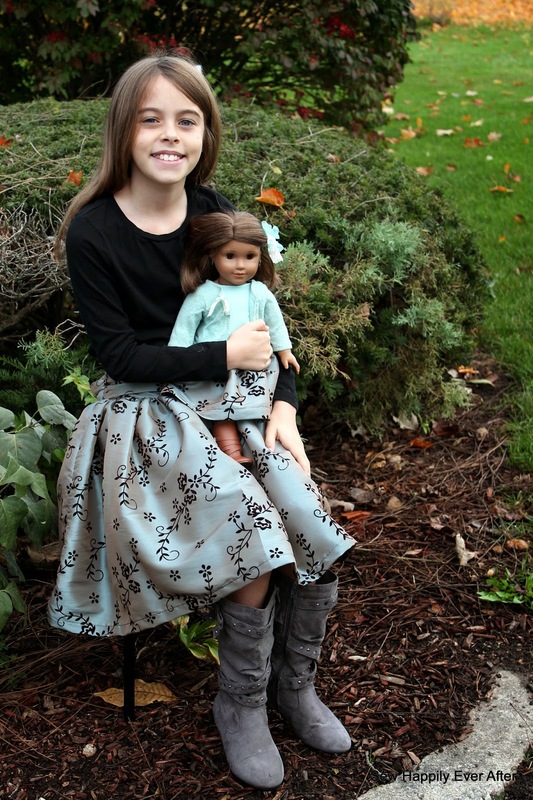 There is a 30% off coupon code available when you purchase Kenzie's Party Dress pattern. And don't forget to enter for the giveaway--there are some AMAZING prizes up for grabs. I had so much fun with this pattern! 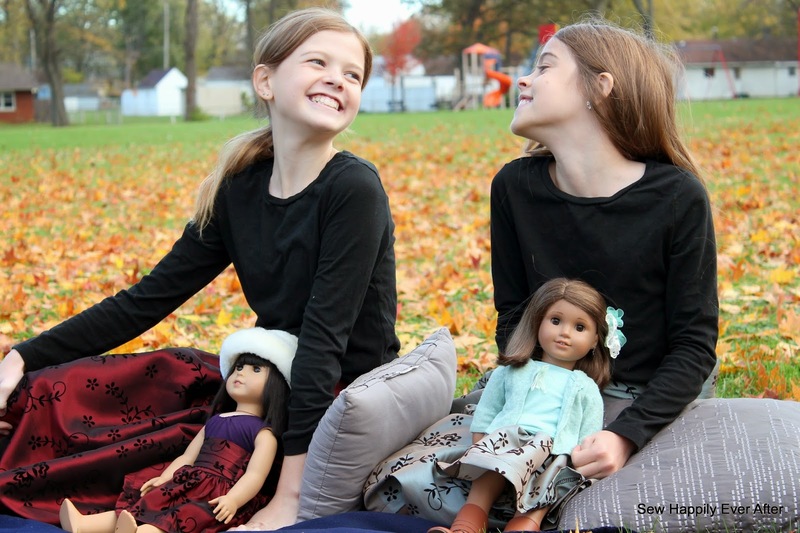 I made matching skirts for my girls and their dolls. 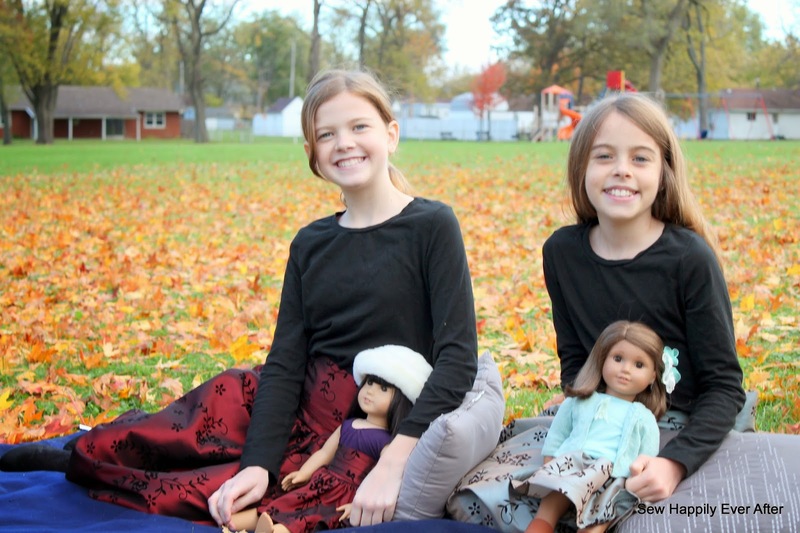 They were thrilled to have matching doll outfits. The skirts are so full and would be gorgeous with an underskirt to really bring out the fullness. However as you can tell from my photos, mine didn't wear an underskirt and the skirt is still pretty full. I have had this flocked taffeta in my stash for 2 years now, just waiting for the perfect outfit. I FINALLY was able to use it! 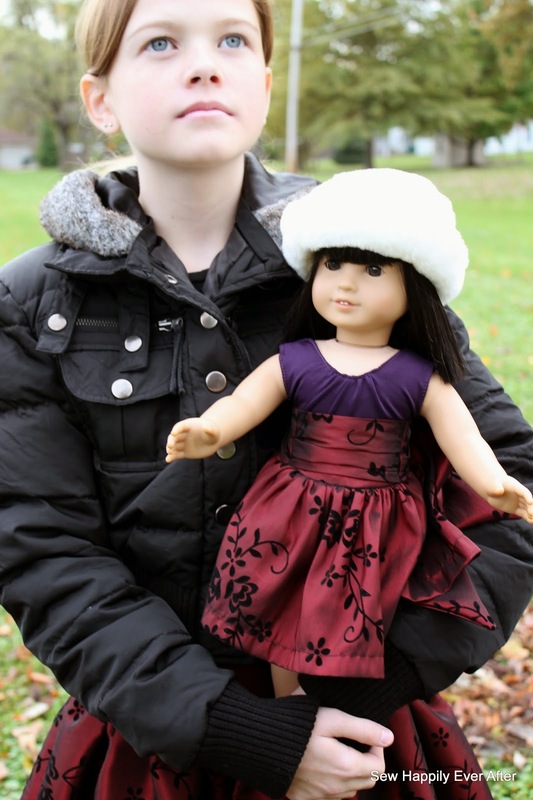 This pattern is available in a HUGE range of sizes: newborn-4T, 5-18, plus a doll version add-on. You can also purchase all of the sizes as a bundle for incredible savings. As always when making any pattern, measure your child first and check their measurements against the measurements given in the pattern. I was able to sew size 8 for my 12 year old and a size 5 for my 11 year old. Also included in the pattern are instructions for achieving a custom fit. The dolls seem pretty happy with their new skirts too. There are several options available to you in this pattern. There are 2 sleeve options, 2 dress styles (signature or simple), or 2 high waisted skirt styles. Included in the pattern are instructions for each version that you might choose to sew. Talk about versatility and options! I think the fabric combinations and possibilities are endless. I think these skirts will be perfect for the upcoming holidays. For reference I chose to sew the high waisted simple skirt option. It's definitely a winner and I will be using this pattern again! 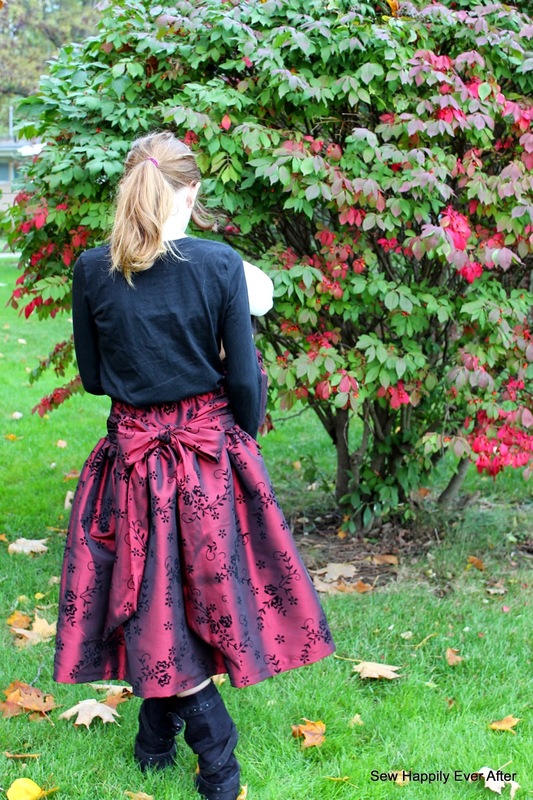 I've sewn sashes and bows before, but I especially love the way this one turns out and how uniquely it is attached to the skirt. It stays in place and looks fabulous when tied. I was originally going to skip the sash, but I'm really glad I added it! This post contains affiliate links. By purchasing through my affiliate links, I earn a percentage of the sales. 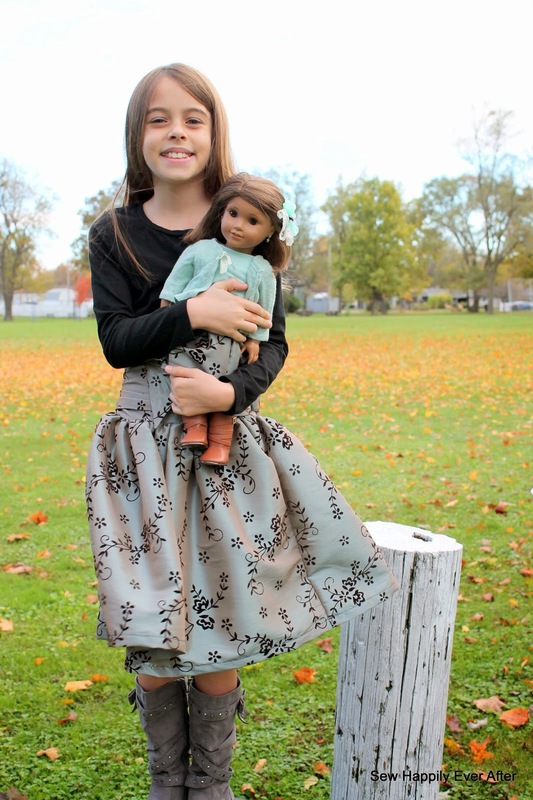 This allows me to purchase more cute fabrics and patterns for my kids. Thank you! Don't forget to visit all of the blogs and enter to win some great prizes! Are you sewing Kenzie's Party Dress? Add your link, so everyone can see your awesomeness (and for another chance to win)!